You have just 7 seconds to make an impression. In that short time a person makes a judgement on what you presented in their mind. They then scan for data in future interactions with you that reinforces their initial impression regardless of the accuracy, a phenomenon called confirmation bias. So what your brand communicates in the first 7 seconds, can make or break the sale, business deal, customer, or vote. And from commodities to consumer products to political campaigns to disease stigmas, it starts with a brand. Our Innovative approach to branding and/or rebranding is unique. Our network of experts use any and every tool to make sure what we create for you stands out from the crowd; whether we are talking about a new product to market or a politician. We find your unique offering to your audience, and make it shine. Most sales people will tell you they are the most important. Marketers tell you their message is what ‘made’ the product or project. Ad agencies will say their ‘creative work’ or ‘service’ is to account for success. The legal team says it is their IP solutions. We believe it takes a balanced approach and thorough Analysis of all disciplines with an understanding of how they work together. We have that understanding. Find out about hiring Innovative for your strategic project, including product launches, political campaigns, nonprofit management, B2B marketing, and more. So many start their projects without a competitive analysis. It doesn’t need to be expensive focus groups or primary. Often times others have done the research for you and it just needs to be put together and analyzed. We visit retailers, businesses, libraries, industry trade publications, survey competitors, and scour the internet to determine the probability for success. We do not take on a project we don’t 100% believe will succeed. The way to find this out is through this step. The choices in development tactics are critical. We will determine the most relevant and important steps we need to take to make your project successful, and prioritize based on your budget. We create the plan and get your buy-in on what we see is the best way to move forward. A first impression is everything. We make sure that everything you do to grow yourself or your business emits quality. We have worked with budgets large and small and know that it’s critically important to put everything you have into your project. Well, of course, first we celebrate for a job well done. But if we wait too long we’ll get behind the curve. So let’s get moving! What comes next? A new product/service or project? How do you use your competencies in the next round? How does it make sense for you to expand? We take all of this into consideration when we build on your foundation. We also work with experts in the field. So if we don’t know the answer to the question or challenge – we know of someone who does. Kathryn Goetzke, President, Chief Mood Officer & Founder, The Mood Factory, Consultant, Innovative Analysis, and Founder, iFred. Kathryn Goetzke is the creator and innovator behind the company. She works with teams around the world to help her clients project and needs. She uses her extensive 20 years of marketing experience, connections, and collaborators to turn every project into reality for her clients. Kathryn Goetzke is an entrepreneur, philanthropist, strategic consultant and global depression advocate. She is the entrepreneur and innovator behind Mood-lites™, a brand that achieved over 35 million dollars in retail sales. As her role as Chief Mood Officer at The Mood Factory, her goal is to ‘Improve Moods’ by teaching consumers how to get in the present moment through engaging senses. Armed with an MBA in International Marketing, an undergraduate degree in Psychology, and over 20 years of experience with small and Fortune 100 companies, she aims to do just that with her new line of product based on how scents impact moods. 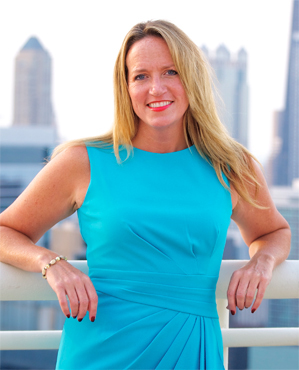 Prior to founding her own company, Goetzke, a world traveler who has worked and studied across the globe, was Vice President of Sales and Marketing for Compass Marketing. She guided Fortune 100 companies including The Gillette Company, Johnson & Johnson, Unilever, General Mills, and others in developing Alternate Channels while leading revenue growth of more than 400% for the agency. Goetzke also led the strategic planning and business development for Brazilian-based Seed Technology Solutions (SeedTS), a Sao Paulo-based technology firm, with income rising over 200% and project acquisitions with Deutsche Bank. Goetzke began her career with 3M Corporation, where she worked as a Research Manager developing a statistical model for determining market potential of street signs at the company’s headquarters in Minneapolis. From there she moved on to expand her experience at American Express by serving in different capacities including New Products, Marketing, Research and Promotions. After her time at American Express, Goetzke moved the mountains in Montana and joined Partners Creative in the world of advertising. 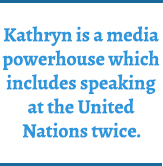 "Kathryn has a unique ability to take in a massive amount of information and synthesize it into a compelling message for the perfect audience. She is a genius at branding and rebranding, whether it be a politician, disease state, or product. Her work directly resulted in significant growth for a number of projects in ways I never imagined possible." In addition to launching Mood-lites, Goetzke founded a non-profit organization for depression called iFred (the International Foundation for Research and Education on Depression – www.depression.org) dedicated to eradicating the stigma of the disease using the sunflower, a focus on hope, the color yellow, celebrity engagement, and education on the biology of the brain. According to the World Health Organization, there are 350 million people around the world with major depressive disorder, yet depression is treatable and episodes often preventable. She is most excited about her new Schools for Hope initiative based on research that hope is a teachable skill and aimed at reaching 5th graders around the world so they may be equipped to always find HOPE. Goetzke and her work has been featured in Entrepreneur Magazine, Home, InStyle, Family Living, Scholastic Choices Magazine, and others. She has spoken at the United Nations twice, the Global Mental Health Movement Athens Conference, at Mental Health Community Associations Conference, the Scent Marketing Institute, and more. She has been featured on multiple radio and television shows including BBC, WGN Chicago, CBS Chicago, Tasty Trade, and eWomenNetwork. Goetzke is a regular contributor to the Huffington Post and PsychCentral, and writes regularly for iFred and The Mood Factory and serves on advisory boards for FundaMentalSDG and the Global Mental Health Movement. Goetzke has a Master of Business Administration degree in International Marketing Management from the University of St. Thomas, and a Bachelor of Arts degree in Psychology, International Studies and Biology from Winona State University. She currently resides in both Chicago and San Francisco, CA, where she enjoys hiking, meeting new people, playing with her nieces, exploring the mountains, skiing, and solving complex global challenges. © 2016 Innovative Analysis. All rights reserved. Site by DK DESIGN STUDIO, INC.